I have been working as an assistant doctor in the Pediatric Intensive Care Unit and Emergency Medical Services of Catalonia from June 2011 to the present. 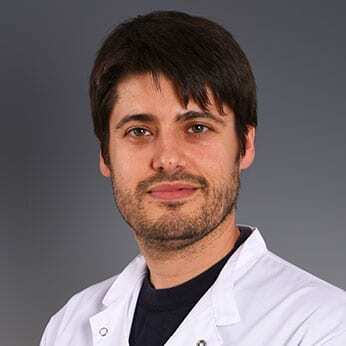 I am a member of the infectious diseases and systemic inflammatory response research group of the SJD Barcelona Children’s Hospital. I also work as a lecturer in courses on pediatric intensive care and advanced life support and programmes of high-fidelity simulation in pediatric and neonatal transport. PhD in Medicine, Faculty of Medicine. Universitat de Barcelona, 2017. Master’s degree in research and clinical sciences, Faculty of Medicine. Universitat de Barcelona, 2012. Degree in Medicine, Faculty of Medicine. Universitat de Barcelona, 2006. Researcher in the area of Infectious Diseases and Systemic Inflammatory Response since 2012. Member of several specialised societies: Catalan Society of Intensive Care Medicine, Spanish Society of Pediatric Intensive Care, Catalan Society of Pediatrics and the Spanish Pediatric Association. Course on advanced pediatric and neonatal life support. SJD Barcelona Children’s Hospital. Universitat de Barcelona since 2016. Resource management in crisis situations for Pediatric Intensive Care. SJD Barcelona Children’s Hospital. Universitat de Barcelona since 2016. High-fidelity simulation in pediatric and neonatal transport. SJD Barcelona Children’s Hospital. Universitat de Barcelona since 2015. Ultrasound applied to the critical pediatric and neonatal patient. SJD Barcelona Children’s Hospital. Universitat de Barcelona since 2015. Advanced Life Support for Pediatric Trauma. SJD Barcelona Children’s Hospital. Universitat de Barcelona since 2014.